Canada's prime minister has stressed his country's claims to the Arctic region on a trip there, days after Russia laid claim to the North Pole. 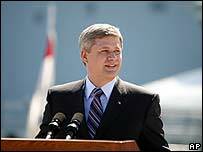 Correspondents say Stephen Harper's tour has taken on new urgency since Russian sailors dropped a flag on the sea bed below the pole last week. "Canada has taken its sovereignty too lightly for too long," Mr Harper said. "This government has put a big emphasis on reinforcing, on strengthening our sovereignty in the Arctic." But the BBC's Lee Carter, in Toronto, says that not everything about Mr Harper's three-day tour of the Arctic is concerned with Canadian sovereignty. Mr Harper also announced the expansion of one of the most remote national parks in Canada's vast and rugged north. However, our correspondent says that when Mr Harper spoke to reporters it did not take long for the sovereignty issue, and in particular Russia's claims, to come to the fore. "I think the recent activities of the Russians are another indication that there's going to be growing international interest in this region," Mr Harper said, speaking in Resolute Bay within the Arctic Circle. Several other countries with territories bordering the Arctic have launched competing claims to the seabed below the North Pole. That area is not currently regarded as part of any single country's territory and is governed instead by complex international agreements. In a unique expedition last week, Russian explorers planted a flag on the seabed 4,200m (14,000ft) below the pole. The move drew derision from Canada, with Foreign Minister Peter MacKay likening it to tactics used in the 15th Century. Canada and the US are also engaged in a dispute over the future of the Northwest Passage, the partially frozen waterway that links the Atlantic and Pacific oceans. The US says it regards it as an international strait but Mr Harper has vociferously defended the passage as Canadian territory. He has already announced plans to build six naval patrol vessels to secure the route.